Monarch Air Group provides private air charter in Providence, RI. Our clients benefit from top-notch service, unrelenting dedication to safety, wide selection of aircraft, and years of experience in chartering private jets. To obtain a free quote, please use our online quoting tool provided below, or call toll free 1-877-281-3051. Monarch Air Group offers air charter services to and from Providence, RI, United States. 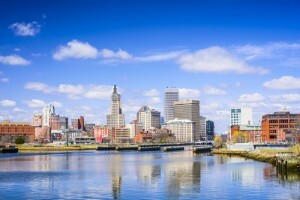 Providence is the state capital and the largest city in Rhode Island located along the Providence and Seekonk Rivers. It is the cultural and educational center in Rhode Island and home to seven institutions of higher education in the state including Brown University, Rhode Island School of Design (RISD), Johnson and Wales Culinary Institute and Trinity Repertory Company. Providence boasts rich New England history, vibrant culinary, arts, music and cultural scene. There are many world-class museums, wonderful galleries and centuries-old neighborhoods. While visiting Providence you have an opportunity to visit exclusive boutiques on Westminster Street. 1. ASH, Boire Field, Nashua, NH, United States. 2. BBF, Burlington, Burlington, United States. 3. BDL, Bradley International, Windsor Locks, United States. 4. BED, Hanscom Field, Bedford/Hanscom, United States. 5. BID, Block Island, Block Island, United States. 6. BNH, Barnes, Hartford, United States. 7. BOS, Logan International, Boston, United States. 8. BVY, Beverly Municiple Airport, Beverly, United States. 9. BXC, Boxborough, Boxborough, United States. 10. CEF, Westover Metro Arpt, Springfield, United States. 11. EHT, Rentschler, East Hartford, United States. 12. EWB, New Bedford, New Bedford, United States. 13. FID, Elizabeth Field, Fishers Island, United States. 14. FMH, Otis AFB, Falmouth, United States. 15. GDM, Municipal, Gardner, United States. 18. HYA, Barnstable, Hyannis, United States. 19. JBC, Boston City Heliport, Boston, United States. 20. JHY, Hyatt Regency H/P, Cambridge, United States. 1. L’Epicureo Ristorante, 139 Mathewson St, Providence. 2. Hotel Dolce Villa, 63 De Pasquale Avenue, Providence. 3. Renaissance Providence Hotel, 5 Avenue of the Arts, Providence. 4. Lupo’s Heartbreak Hotel, 79 Washington Street, Providence. 5. Edgewood Manor Bed and Breakfast Hotel, 232 Norwood Ave, Providence. 6. L’Epicureo Ristorante, 139 Mathewson St, Providence. 7. Hotel Dolce Villa, 63 De Pasquale Avenue, Providence. 8. Renaissance Providence Hotel, 5 Avenue of the Arts, Providence. 9. Lupo’s Heartbreak Hotel, 79 Washington Street, Providence.